It is perfect preparation for Pika Pika Rain Ceramic Coating! Car wash by normal shampoo cannot remove strongly oily dirt. Oily dirt prevents ceramic coating curing evenly on the surface of the car body. Ceramic coat over the dirt might come off the surface in the worst case. 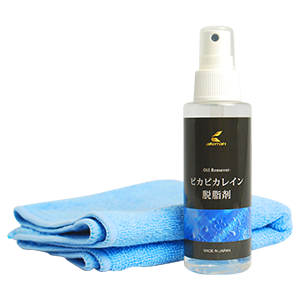 Pika Pika Rain Oil Remover (Degreaser) is the perfect preparation for Pika Pika Rain Ceramic Coating as it can remove extra oily substances and fit Pika Pika Rain Ceramic Coating to the car body securely. Many retail products adopt petroleum solvent which has bad chemistry against Pika Pika Rain Ceramic Coating. However, Pika Pika Rain Oil Remover (Degreaser) fits together perfectly with Pika Pika Rain Ceramic Coatings, and that makes your work with the ceramic coating liquid smoother.